From 41 West on Mooringline Drive to Gulf Shore Blvd N.
Gulf Shore Blvd North off Mooring Line Dr. 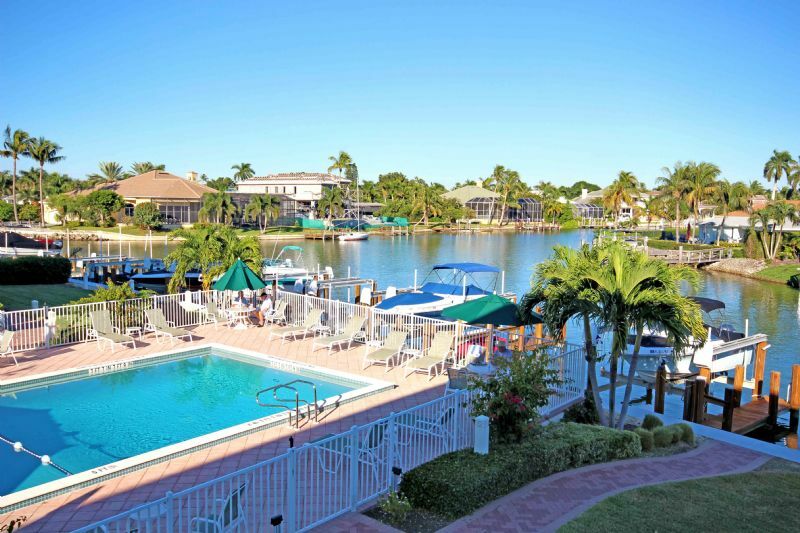 Port au Villa is a wonderful intimate community located on Gulf Shore Blvd. directly across the street from Mooring Beach. This 2 bedroom end-unit is on the second floor and offers dual twin beds in both bedrooms, 2 full bathrooms, windowed kitchen and a Florida room upgraded with brand new windows with gorgeous views overlooking the bay and pool. Prime location close to shopping and restaurants. Downtown 5th Avenue South is just minutes away. For sports enthusiasts, every land and water sport is nearby. Vacation costs consist of: rent, state and local tax, $125.00 processing fee plus state and local tax and exit cleaning plus state and local tax. One or more of the following may apply: condominium application fee, community application fee, golf transfer fee, electric, pool heat, and if applicable a pet deposit or fee.